So for this week, we are going to learn a three-chord, easy ukulele song with this Wabash Cannonball ukulele tutorial. 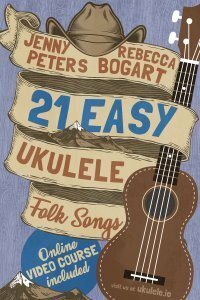 Wabash Cannonball is one of the songs from our new book 21 Easy Ukulele Folk Songs. The book is out now so don’t forget to get your copy here. Certainly, you’ll find this Wabash Cannonball ukulele tutorial an easy one to follow because you just play with three easy chords: C, F and G7. Moreover, you make a simple D-DU-D-DU (D-down, U-up) strumming pattern for the play along version. Although Jenny does some chunking technique to add some percussive effect, like the sound of a train, you can choose not to do this. If you do like to do some chunking, Jenny does this by hitting the heel of her thumb against the strings as her hand strums. 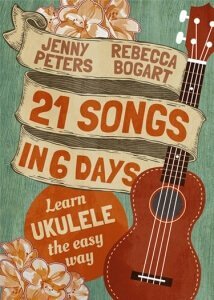 And for those solo ukulele enthusiasts, Jenny also shows how to play the tab at the end of the video. By the way, join us for a Facebook live lesson on Wabash Cannonball ukulele tutorial later this week. But first like and follow us on Facebook if you haven’t yet. If you’re not able to catch the live lesson, you can find a copy of the video under the videos section. In addition, don’t forget to subscribe here and get weekly email notifications of ukulele tutorials. Most importantly, these notifications include downloadable sheet music with lyrics, chords and tabs for the featured song. 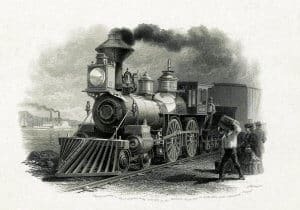 While some may think Wabash Cannonball was derived from the name of an actual train by the Wabash Railroad, it’s actually the other way around. In short, the Wabash Railroad named one of its trains, a daytime express that ran a route from Detroit to St. Louis, to Cannon Ball because of the popularity of the song. J.A. Roff wrote the earliest known version of Wabash Cannonball. Accordingly, Roff released a sheet music in 1882 called The Great Rock Island Route. Other musicians released edited versions of the song over the years, many of which had variations of the verses and chorus. For instance, William Kindt rewrote a version of the song which he issued as Wabash Cannon Ball in 1904. Two popular recordings of the song were released in the 1930s. Firstly, the Carter family, consisting of A.P., Maybelle and Sara, recorded the song which was released in 1932. Moreover, Roy Accuff released his version four years later, which became one of the best-selling singles of all time. Subsequently, other musical greats recorded the song such as Blind Willie McTell, Bing Crosby, Johnny Cash, Hank Thompson, Willie Nelson, Roger Miller and Jerry Reed.